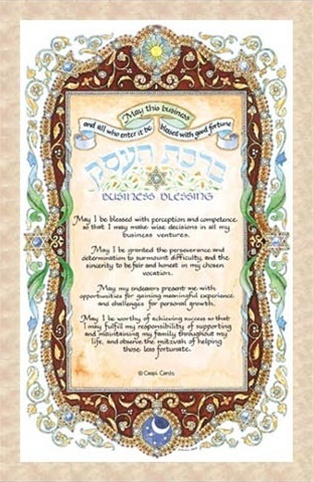 Framed Size: 9" x 13"
"May this business and all who enter it be blessed with good fortune." A rich gold and brown border surrounds the parchment which holds this blessing. May I be blessed with perception and competence so that I may make wise decisions in all my business ventures. May I be granted the perseverance and determination to surmount difficulty, and the sincerity to be fair and honest in my chosen vocation. May my endeavors present me with opportunities for gaining meaningful experience and challenges for personal growth. 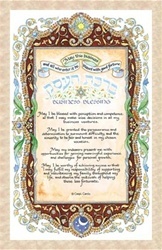 May I be worthy of achieving success so that I may fulfill my responsibility of supporting and maintaining my family throughout my life, and observe the mitzvah of helping those less fortunate. Available in Gold Frame and Royal Blue Mat.